I love spring and warmer temperatures. I also love this time of year because we can finally start grilling out and going on picnics. And eating salads, like macaroni salad. I love salads. Whether it’s spring salads, cucumber salads, potato salad, and macaroni salads, to name a few, I enjoy making and eating salads. I also love the flavor of toasted (as well as roasted and grilled) corn. Corn is a great vegetable to add to salads, I think. 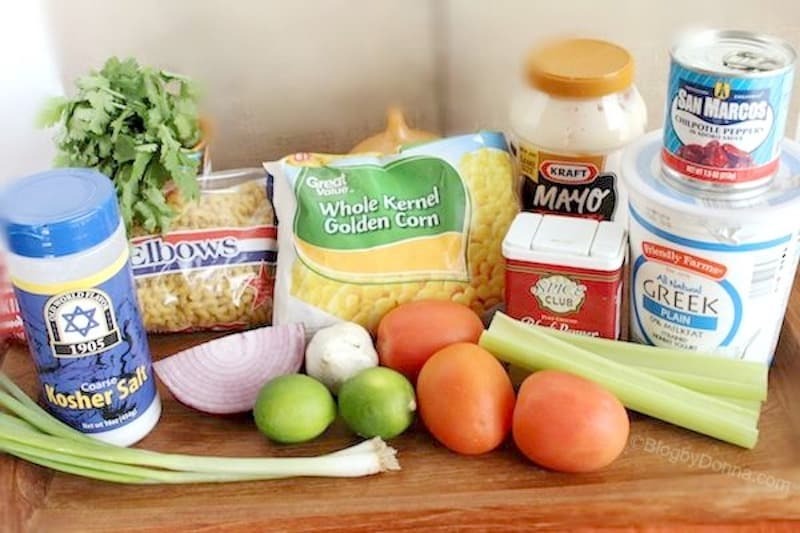 Have you ever tried corn in macaroni salad before? Whether it’s toasted, roasted, or grilled, it is a wonderful addition to macaroni salad. It’s the perfect salad for a picnic, cookout, summer gathering, or barbecue. 2 teas. Adobo sauce from can of Chipotle Peppers in Adobo sauce. 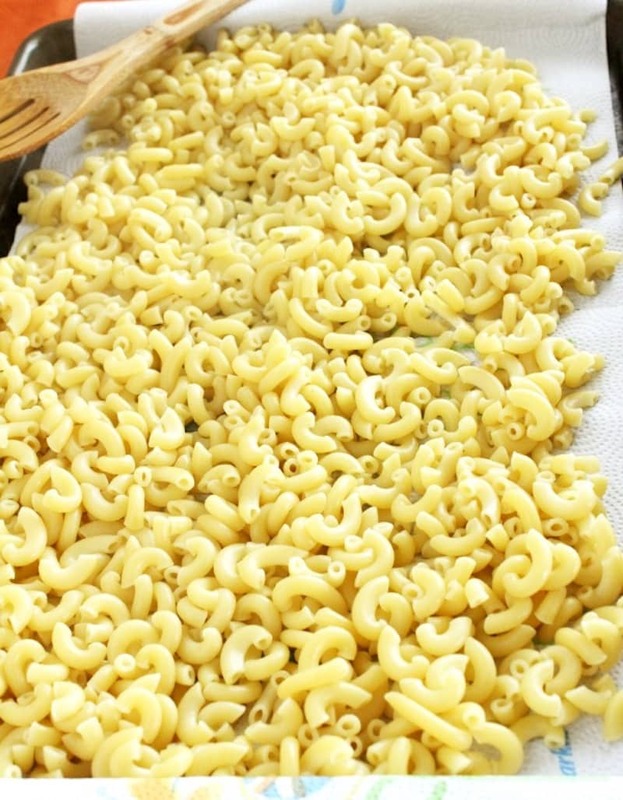 Cook Macaroni in salted boiling water for approximately 7 minutes. It should be firm to the bite not mushy. Drain well, give a good shake. Remove to a baking pan lined with paper towels to dry while you make the sauce and chop the veggies. 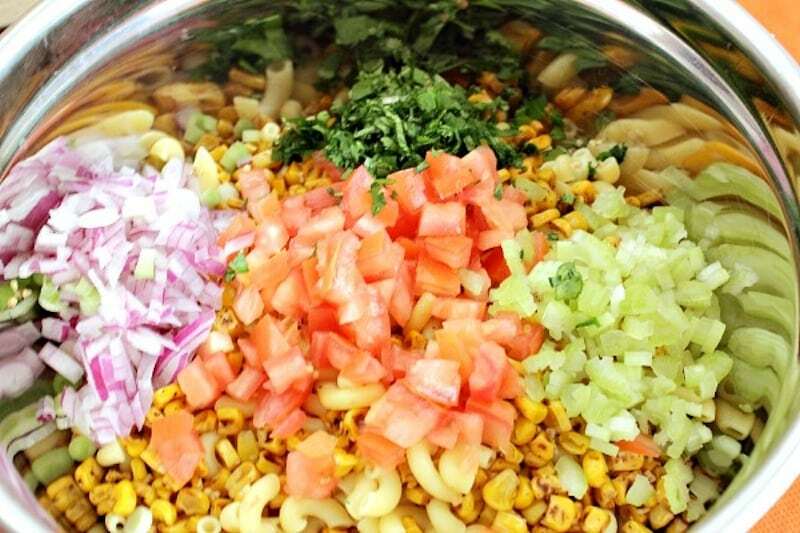 Put dried Macaroni in a large mixing bowl with the Red and Green Onion, Celery, Tomatoes, and Cilantro. 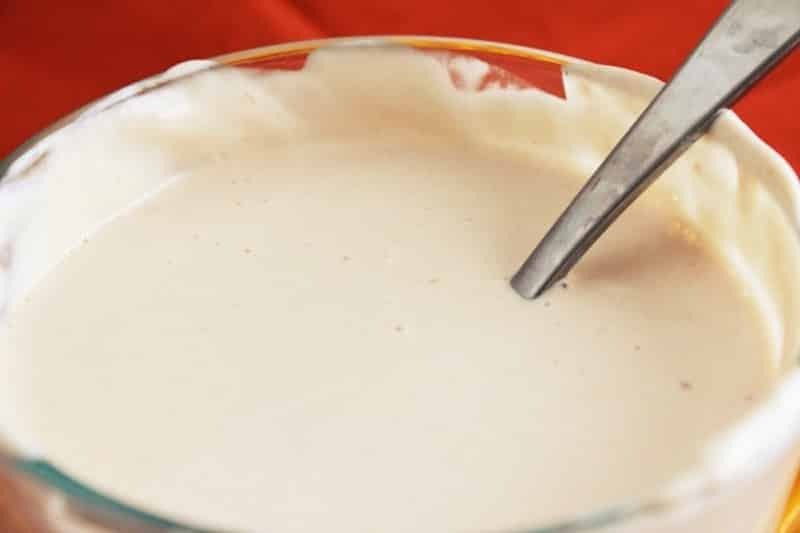 In a small bowl combine the Mayonnaise, Greek Yogurt, Adobo sauce, and Lime Juice. Set aside. 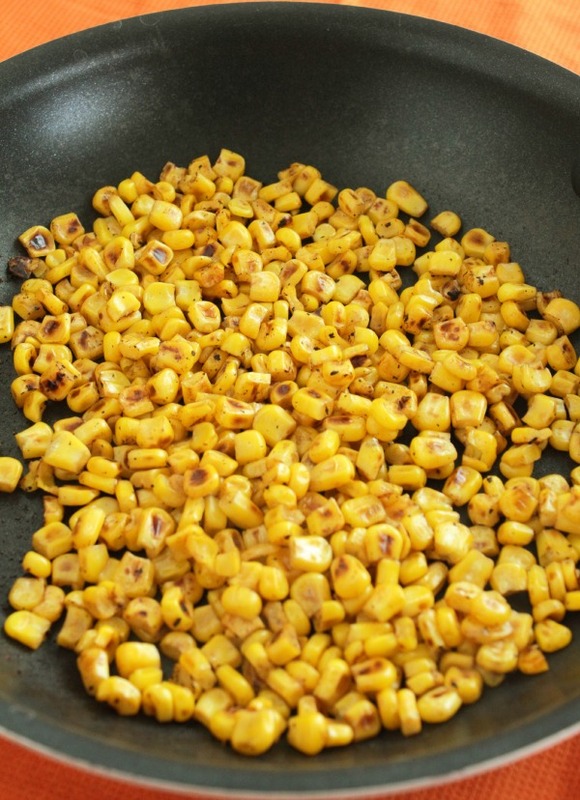 In a nonstick pan over high heat toast the Corn until browned, stir or pan flip often. When they are popping you’ll know you’re close. Just before the corn is done add the Garlic so it gets toasted, about 30-45 seconds is all it needs. Add to the mixing bowl with the Macaroni. Add the dressing and toss to coat. 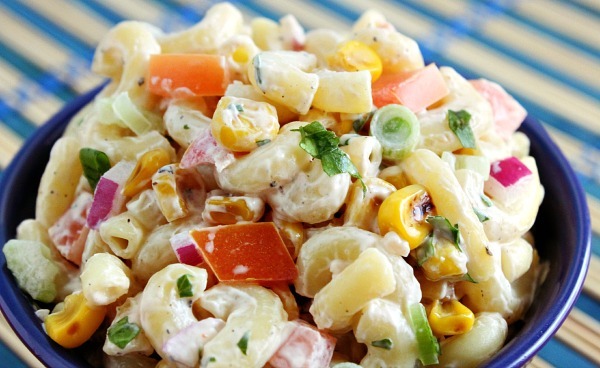 This macaroni salad would be a great side dish for this Rosemary Sea Salt Chicken recipe. What’s your favorite spring and/or summer salad? Oh that looks nice and creamy and delicious. That looks delicious! I love summer salads. Yum. the toasting of the corn must bring out a nice subtle sweetness too. Yum!! My husband would really like this. I love that you can just pretty much dump it all in then make something so yummy! I actually enjoy potato salad a ton! This toasted corm macaroni salad looks delicious. I’ll definitely have to try it. Now that is a different kind of macaroni salad…looks yummy. The pic really pops at ya :). Thanks for sharing the recipe! Happy Friday Donna! I never thought about toasting corn like that…great idea! Bookmarked! I have a potluck coming up and this looks like the perfect dish to make, thanks for sharing! Looks delicious and so vibrant with color. I’ve never toasted corn like that but I’m sure I would love it! Wow this looks amazing. Pinning for later and thank you for sharing. 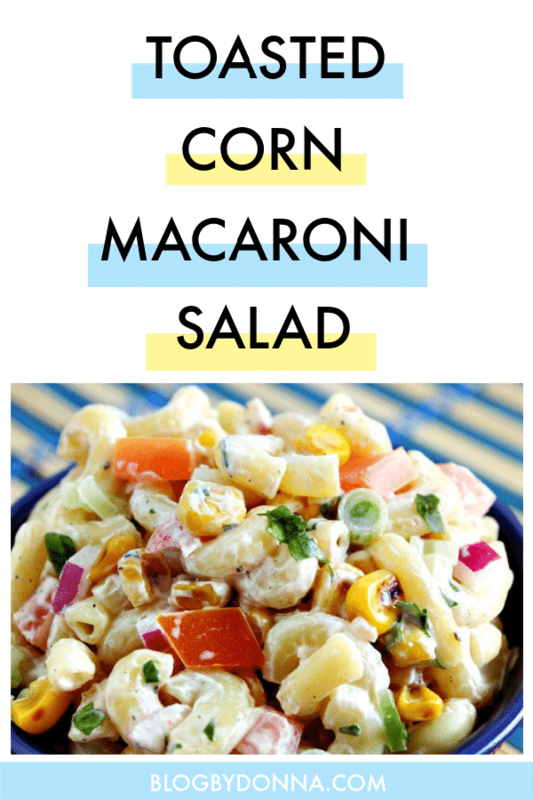 I’ve never seen macaroni salad with toasted corn before, seems like it would be a great way to brighten it up. Thanks for the recipe, I think I will make this for our next family BBQ.